We are parked just below the sea level sign that is perched high above on the jagged side of a cliff in this Amargosa Mountain Range. As I anxiously sit in the stuffy van, beads of sweat stream down my face as an unusual dose of humidity settles into the area. It’s nine-fifteen in the morning and already a stifling 110-degrees. In forty-five minutes, thirty-one runners will begin the 135-mile journey through Death Valley and traverse two long mountain passes before finishing at the Portals (8600-feet), halfway up MT Whitney. During the race air temperatures will reach 130-degrees and the pavement will be a toasty 200-degrees. 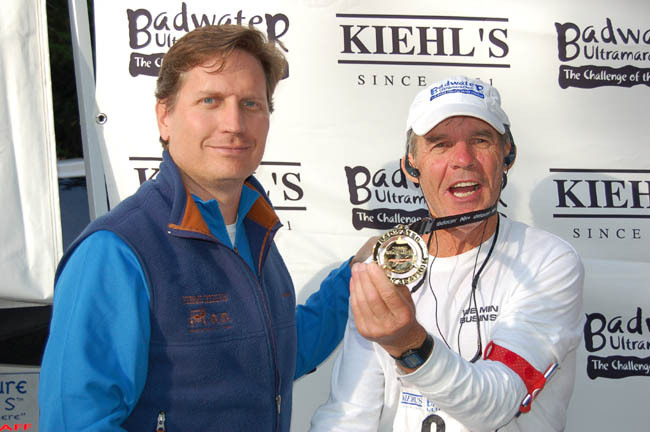 This is the Kiehl’s Badwater Ultramarathon and is billed as the toughest footrace in the world. As other runners caravan in for the start, I begin to fidget and fuss. Although I am mentally and physically prepared for the enormous challenge ahead, I question everything. Did I do enough heat training? Did I run enough in the hills or on the flats? Since I am super hydrated, why I am cotton-mouthed and thirsty? Worry wart! Just before ten o’clock, all the runners are having group pictures taken by the lacquered wooden marker with yellow lettering, noting that this is the Badwater Basin; at two-hundred and eighty-two feet below sea level, it is the lowest point in the Western Hemisphere. As the National Anthem plays, I wonder, what I am doing in this group of incredibly talented athletes. Scott Jurek, Pam Reed, Ferg Hawk, Monica Scholz, Dean Karnazes, and Charlie Engle are here. 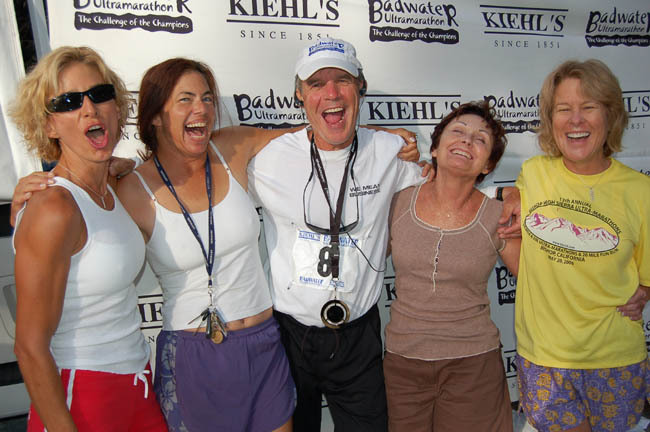 They have all finished Badwater in less than thirty-hours. Egad! After the word is given to start this momentous task, I immediately slip to the back of the pack. At 64-years, I am the oldest and slowest. This will not be a tortoise and hare story because I will never deliberately catch any of these runners. My goal is to use course knowledge, a ton of experience and a truck full of tenacity to make it to the finish line. I hope they don’t consume all the pizza and cold beer before I get there. My crew, three beautiful ladies from Bishop, CA, Debbie Masters, Diane Spieth and Kari Marchant along with my wife Christine, the prettiest of all, will do yeoman’s work by leap-frogging me in the Enterprise rental van and, at times, will pace for me. They will pamper me the entire race. In order to keep me relatively cool in the scorching heat, they will wrap iced-bandannas around my neck and spray cold water on my light colored safari hat and long-sleeved white Capsilene shirt. Once every hour, I will snack on a bottle of Ensure or a mix of Hammer’s Perpetuem, chased with a big gulp of Crystal Geyser water, Crystal Light, PowerAde, or a Starbucks Frappacinno. Every twenty minutes, during the heat of the day, I will swallow a couple of Endurolytes (sodium, magnesium and potassium replacement capsules that help ward off dehydration and cramping.) That’s it. Yum! Although there is absolutely no guarantee of finishing this monster and the next two days will dole out a pinch of misery, pain and a splash of pleasure, it is a privilege to be here. This will be my ninth consecutive Badwater Race. As I run along Highway 178 on the edge of Death Valley’s sprawling salt basin, which appears to be filled with water as the pure white dried out surface shimmers from the undulating heat, the anticipation, apprehension and jitters begin to fade away as endorphins start flowing through my system. After a few miles a minor problem has developed. My left foot, which was rubbed with Hydropel (a gel that is advertised to prevent blisters) and not enough foot powder, is sliding in the shoe (blisters are caused by this rubbing friction). Hopefully it will soon settle down. Clomp, slide, clomp. It takes three and a half hours to run to the Furnace Creek Resort checkpoint station (mile-17). 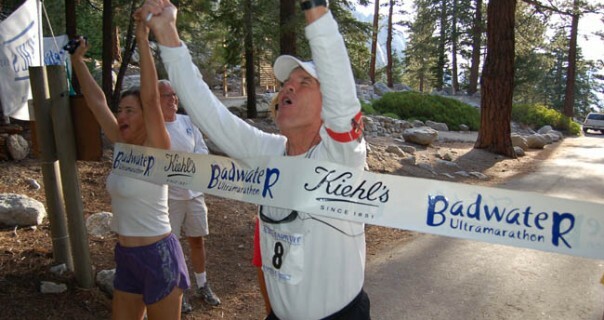 Jack Denness (clipboard check-in man and eleven-time Badwater finisher) tells me, “You have to go back to the start because of a rule infraction.” I think he is kidding me; at least I hope so. I sit on the stoop of the van for a few minutes and place a different pair of shoes and socks over my water soaked and shriveled feet that reveal early signs of ugly blistering. Ten minutes later I set off for Stovepipe Wells (mile-42). Although there is beauty in the basin and on the colorful stratus of the surrounding hillsides, the searing and intense heat makes this portion of the race a monumental chore. It is almost a marathon in distance as it meanders through the arid desolation in Death Valley. This year I have strategically broken it down into smaller sections. By focusing on several landmarks, (about four miles apart), Cow Creek, another lowest elevation sign, the Beatty turnoff and Salt Creek, my intent is to cover this part of the race with less stress. It works. By the time the race turns west at the Scotty’s Castle exit (mile-35), I am more relaxed and less tired than usual. While I run between the incredibly sculptured Sand Dunes to the north and the Devils Cornfield (a sea of crystallized salt clumps) to the south, the wind begins to blow sand and extreme heat across the basin. It never really changes through here. Every year, as if on cue, it gets windy and the suffocating 130-degree blast furnace-like heat stings my face and scorches my lungs. As I hunker down and run the next seven-miles across the valley, I encounter a major problem, but it is not mine. Something is very wrong because I have caught Pam Reed (two-time Badwater race winner) who is barely shuffling along. “Since the start of the race I have had problems with fluid intake and I think I am severely dehydrated,” Pam says. For health concerns her race will be over in a few miles. It’s sad and I feel bad for her. Unfortunately, even the best athletes have their off days. With patriotic spinning pinwheels and an American flag flapping in the super-heated breeze, Debbie, Kari and I run yelling and screaming into the Stovepipe Wells check-in station. At nine-hours and thirty-minutes, I am right on schedule. I forego the small hotel pool that is filled with overheated-runners and their crew. Instead, in a room we have reserved, gingerly step-into the tub for a quick cold shower, but, like a cruel joke, both taps are hot? Before jamming my shoes back on, numerous large blisters on both heels and several toes are sliced open. I use no tape; it’s just cut, drain and get back on the road. Ugh! Except for a few moments that Kari walks with me, the next seventeen-mile steep trek to Townes Pass (mile-59) is a lonely six hour power-walking struggle. In the past I have ran and alternately walked, but it has been extremely exhausting and, at the top, there was little left in my tank. As the sun sinks behind the mountains, the intense heat begins to dissipate. Although it is cooler, my body is still under enormous stress as I chug forward. Dehydration is always a major concern and fluid intake, even at night, continues to be a top priority. To ward off cars and other scary things I wear red flashers on my arms and legs. I also carry a small flashlight, but it’s almost not needed. Billions of stars have lit up the evening sky and comets, meteors, shooting stars and spaceships are streaking everywhere. Although the going is tough, I am fortunate to be here; and, jazzed to see the universe in the raw. Man, this is good stuff. Just before cresting the mountain a ten minute respite, on a lawn chair, is needed. My favorite part of this race is running down the nine-mile western slope of Townes Pass to the eastern edge of the Panamint Valley Salt Flats (mile-68). In the cool of the evening, I pass Vista Point where you can see MT Whitney about seventy-miles away. Near the bottom, I catch Shannon Farar-Griefer and her pacer who ironically lives only a few miles from me in Northern California. No one escapes. If you run Badwater something along the way will likely sink its nasty hooks into you. It might be throwing up, cramping, dehydration, heat illness, mental or emotional fatigue or a myriad of other possibilities. This race is a gut check and it will test you in every possible way. If you are mentally strong and can handle lots of suffering and pain, it’s possible to recover enough to move ahead. Forget the prerace,”The best laid plans of Mice and Men” idea, and put them in the shredder. I don’t know about the front-runners, but for the rest of us getting to the finish line is a constant process of red-lining and overcoming numerous bad episodes. Period. I am getting extremely fatigued and the last three-miles into Panamint Springs (mile-72) are laborious and slow. Both feet are screaming for relief from the severe blistering. So, I ditch my running shoes for black rubber thong sandals. My reward is the shattering realization that dawn has arrived and not only am I facing a steep eight-mile climb to Father Crowley Vista Point (mile-80), but also another hot day of struggle. Yikes! A few miles later the sandals are not working. They are wet and my feet are slipping out of them sideways. The toe strap is slicing deep into the skin, at the joint, on the bottom of my right toe. “Oops,” I tell my crew, “That was a bad idea.” I try walking barefoot but the asphalt is too hot and my feet literally begin to sizzle and cook. So sans socks it’s back into the painful but bearable running shoes. As the “wheels are coming off,” the sheer beauty in Death Valley gives me a much needed emotional lift. About a mile from the top, the swath of road below appears to have been carved out by a large snake that had slithered across the iridescent Panamint Salt Flats and through the surrounding brown hued mountain passes. The panoramic view of this vast expanse is breathtaking. The best part is that I have already trekked it. At the top during another change of shoes and more blister draining, a newly-wed tourist couple saunters over to our van. They are aghast and shake their heads at how many times I have completed this race. Oh well, they just don’t understand! But, that’s okay, because no one else does either. For the next few miles the road winds along the base of a small mountain outcropping and empties into the Darwin Flats. Sprinkled amongst the sagebrush are weather beaten Yucca trees. Although they provide only a slice of shade, I imagine that all the animal life in this area are nestling at the base of these prickly covered scarecrows. It always amazes me how anything can survive in this oven-baked desert. Debbie then Diane walks with me during this portion. After the road crests over a rather long knoll, I start to run again. I pass the Death Valley National Park Boundary Sign (mile-85) and cross five-miles of rolling hilly terrain before walking the last few feet into the Darwin turnoff check-in station (mile-90). Suddenly, I hear the unmistakable roar of jet engines slicing through the morning sky. The noise is loud and almost deafening. “There, look, right up there,” I shout, while jumping up and down. A powder blue F-16 is flying sideways and only a few feet over our heads. Within seconds the pilot tipped his wing, banked to the north and was gone. I have no idea if he was greeting us or simply practicing his strafing technique, but it doesn’t matter. This show was almost worth the price of admission. Reenergized, I feel I can run the Centennial Flats; the next ten-miles of gradually rolling downhill’s. All goes well until just before the large white cross (mile-96). Although it’s at least twenty-degrees cooler than yesterday and I am still being soaked with cold water, my body begins to overheat. According to the law of diminishing returns, as the body temperature rises, performance suffers. Well, duh! Just a minute ago I was running okay, but now I have to climb into the van, lie down and cool off. With iced down towels draped on my head and shoulders and Debbie tagging along for moral support, I am soon back on the road. Since I still suffer from some classic heat stress symptoms my condition is tenuous at best, and there are still thirty-nine miles to go. Yuck! The next eight-miles of running are more of a shuffle-walk. I have another heat episode (mile-104) and have to get into the van again. To cool down, I sit in a bucket of ice water. Then I dip my head into a brain-freezing ice and water filled chest until the back of my eyes feel like they are being clubbed with a hammer. A pounding headache that feels like it is going to explode will bother me for an hour. To give my crunched feet some relief the toe box in my shoes are cut out. Even though I feel pulverized, I continue to shuffle towards the metropolis of Keeler (mile-108), population 98. Just ahead, ominous thunderheads roll in from the Eastern Sierras and blankets the Owens Valley. Booming thunder fills the darkened sky and crackling lightning crashes into the nearby hillsides. Actually, getting zapped might feel good. Unfortunately, we are on the edge of the heavy rain, and only a few sprinkles splash the roadway. A soaking in a downpour may cool me off, but as we push forward the rolling storm moves away. Drat! There is some minor flash flooding in the area and rumor has it, “The rains have chased the sidewinders onto the road.” Great! Just before stopping in front of Keeler to ice-down and gorge on a meal of Ensure, an invigorated Shannon and my mountain climbing buddy Bob Haugh, who have been playing cat-and-mouse all day, pass me for the last time. Doctor Ben Jones, the “Mayor of Badwater” and roving race magician, stops to take a few pictures (I assume cover shots for Men’s Health, GQ or Vogue magazines), gives us a warm greeting and then drives away. I get a short-lived boost knowing that Ben was not too concerned about my condition. So, I must be okay. At least I am vertical. In past races Ben has found me lying in the dirt along this course suffering from dehydration, cramping and other cruddy things. In the past I have run the next twelve-miles into Lone Pine, but not this year. As it gets dark, it should be cooler and easier, but it is not. The wet towel routine is no longer working. In this same location last year, I was also unable to run and I can’t figure out why? Maybe its age related, or maybe it’s a coincidence, or just maybe after two days of strenuous effort the dial on my gas gauge is simply hovering deep into the red. Thirty-minutes later, feeling as “balanced and normal” as I possibly can, I put shoes and socks onto my blistered hamburger-like feet, and begin the thirteen-mile steep climb to the finish line at the MT Whitney Portals. It’s three o’clock in the morning. Howie Stern, a running friend, walks with me for an hour before he has to leave to go to work. Now it’s me and the music-laden iPod that’s strapped on my arm; so, I start singing and power-walking. It’s hard to believe, but less than an hour ago I was spent and totally exhausted. Now I am spunky and for the next hour sashay up the mountain. In the dark, a few miles from entering several long switchbacks, I get weary again. My biggest concern is whether I will be safe from all the strange figures that are fading in and out of the bushes along the roadside. I tell myself, “Be calm and relax,” although panic is not far behind. Next time I will bring a can of dog repellant. As the sun rises they disappear, and I continue to gulp down Ensure and Frappacinno’s to help ward off exhaustion. Every runner who finishes this race in less than forty-eight hours is awarded a coveted Badwater belt buckle. My tired and frazzled mind is making a million miscalculations about the estimated completion time. My crew tells me to, “Stop worrying and quit whining, you still have plenty of time.” I am so close to the end, yet, still not convinced. At last, I make the right hand turn into the first switchback (mile-131). With the “end in sight,” I figure it should only take about an hour from here. At the tree lined entrance to the park, with one mile to go, I see the postcard view of the majestic Mt Whitney. Unless something catastrophic happens like walking off one of the steep cliffs, or carted away by the bears foraging for snacks in the parking lot just ahead, it finally sinks in that I am going to make it. It really gets emotional and I start celebrating by cranking up Led Zeppelin’s, “Stairway to Heaven.” I hold the Stars and Stripes up high, and to prove that you can have some fun at Badwater, “cry out” in victory. With only a few short turns to go, my crew trots down to meet me. We are giddy and making lots of noise all the way to the finish line. Hurray for all of us; we did it! The time gets a bit slower each year, but at 45:07:21, I will take it. And, I have a little secret confession to make, finishing Badwater keeps getting better and better. As we begin our trip home, it’s difficult to leave the last six days behind. Especially, the camaraderie, the incredible Badwater journey filled with pain and pleasure and the sheer beauty that is in Death Valley. This morning, for icing on the cake, I had a reunion with the kids that I ran for at the Valley of the Moon Children’s Home in Santa Rosa, CA. There was some beaming and a bit of pride in their classroom. It was fun rehashing the race, showing some video and answering their great questions. My ultimate goal is to plant a seed with these kids with the message, that no matter how tough things seem to be at the moment, if you work extremely hard at the goals of your choice and never, ever give up, the respect and confidence that follows will have a major positive influence on you and all the people you touch. Last year a young teenager came to me and said he had already run away from this (wonderful) facility twice, but now he was going to stay because of what I had accomplished. That stopped me almost dead in my tracks; like a dart to the heart. Well, maybe it’s the tremendous satisfaction from overcoming all the adversity, maybe it’s the pain, maybe it’s the challenge, maybe it’s the finish line, maybe it’s the buckle, maybe it’s….… But, to have made such a positive impact in the life of a kid, who struggles each day far more than what we will ever encounter in the desert, is the most special reason of all. Thanks to race director Chris Kostman, his AdventureCORPS crew and all the volunteers who have made Badwater a top notch race. Thanks to the ubiquitous Dr. Lisa Bliss, the entire medical staff and the ambulance crew patrolling the area, ready to assist. But, they always seemed to be dogging me like a buzzard ready for its next meal? Easy prey, I guess! Thanks to all the crews for helping the runners fulfill their dreams. Kudos and high fives to the runners, and, especially, to those who struggled across the desert but did not make it. The recognition at the awards ceremony for their effort was a real class act. Congratulations to Lisa Smith-Batchen and John Radich on their successful 300-mile Badwater doubles. Wow! I thought I was tough. I believe my buddy, Jason Hunter, “Somewhere over the Rainbow,” whose energizing spirit was the secret weapon I had in my hip pocket, would have been proud. Finally, thanks to Christine, my Rock of Gibraltar wife of 38-years, for steering me in the right direction. Although she has heard it many times before, I believe that next year will be my last Badwater race. Anyone want to buy a bridge? 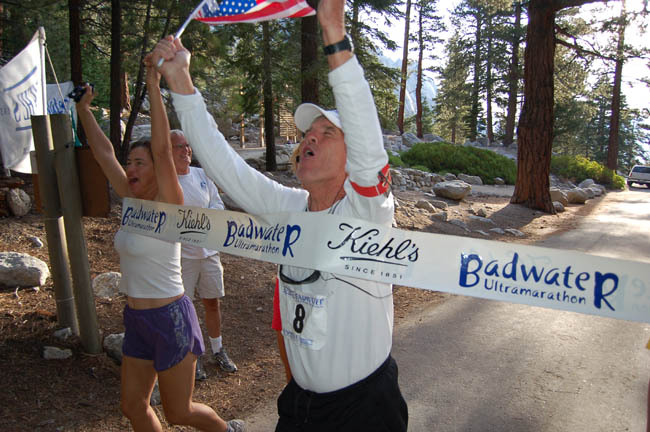 It was an honor to be a part of the 2006 Kiehl’s Badwater Ultramarathon.